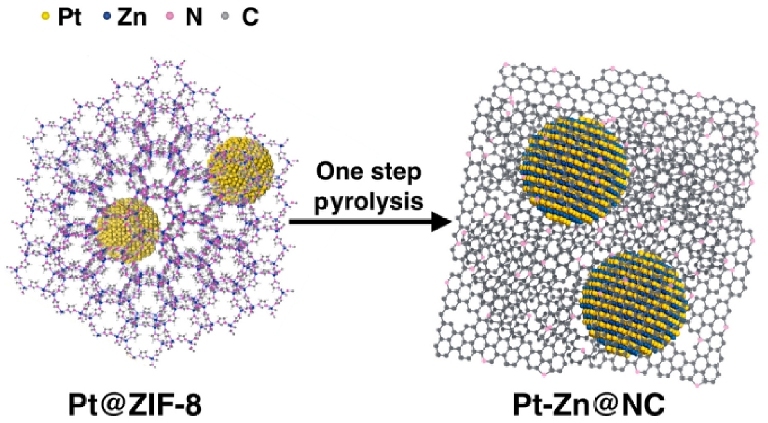 We report a facile strategy to synthesize intermetallic nanoparticle (iNP) electrocatalysts via one-pot pyrolysis of a zeolitic imidazolate framework, ZIF-8, encapsulating precious metal nanoparticles (NPs). ZIF-8 serves not only as precursor for N-doped carbon (NC), but also as Zn source for the formation of intermetallic or alloy NPs with the encapsulated metals. The resulting sub-4 nm PtZn iNPs embedded in NC exhibit high sintering resistance up to 1,000 °C. Importantly, the present methodology allows fine-tuning of both composition (e.g., PdZn and RhZn iNPs, as well as AuZn and RuZn alloy NPs) and size (2.4, 3.7, and 5.4 nm PtZn) of the as-formed bimetallic NPs. 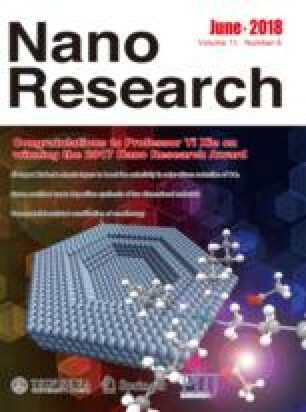 To the best of our knowledge, this is the first report of a metal-organic framework (MOF) with multiple functionalities, such as secondary metal source, carbon precursor, and size-regulating reagent, which promote the formation of iNPs. This work opens a new avenue for the synthesis of highly uniform and stable iNPs. Supplementary material (detailed synthetic procedures for control samples, characterization of Pt-Zn@NC, M@ZIF-8, and M-Zn@NC including TEM images, XRD patterns, XPS and ICP-MS analysis, and tables of calculated/counted particles sizes and summary of reported particle sizes) is available in the online version of this article at https://doi.org/10.1007/s12274-018-2016-x. Acknowledgment is made to the donors of the American Chemical Society Petroleum Research Fund for support of this research. We thank Gordon J. Miller for the use of the X-ray diffractometer. We also thank Dapeng Jing at the Materials Analysis and Research Laboratory (MARL) of Iowa State University for the assistance on XPS measurement.